ON THIS DATE (August 14, 2007) ... It took one batter for Jon Lester to compose himself tonight. The Red Sox spent the rest of the night trying to find a way to reward him for his bravura effort, including a three-strikeout inning by Eric Gagne, the reliever who was greeted by boos but left to cheers. Down to their last two outs, they found the way. 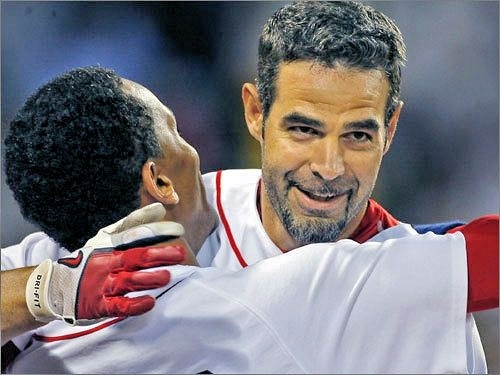 Mike Lowell homered over the Monster to tie the score, Jason Varitek lined a two-out ground-rule double into the right-field grandstand, and Coco Crisp lined a single to right to bring home Varitek for a 2-1 win over the Tampa Bay Devil Rays at Fenway Park. Lester, the recipient of a sustained ovation from a sellout crowd of 36,837 primed to celebrate his first outing at Fenway since he was diagnosed with cancer last August, fell behind the Tampa Bay leadoff man, Akinori Iwamura, three balls and no strikes, then walked him on a full count. That would be the only walk surrendered by the 23-year-old lefthander, who allowed the Devil Rays just two hits and retired the side in order in six of the seven innings he pitched. He allowed just one run, when Carl Crawford doubled, B.J. Upton blooped a single off Dustin Pedroia's glove, and Carlos Pena hit a sacrifice fly. Lester was lifted by Francona after throwing 97 pitches. He retired the last 12 batters he faced and could not have been more efficient than he was in the sixth and seventh innings, when he set down the Devil Rays on eight and six pitches. The Devil Rays threatened against the Sox bullpen in the eighth. Eric Gagne, given the ninth, struck out Pena looking on a changeup, then blew away Delmon Young with a 93-mile-an-hour fastball. Brendan Harris doubled over Drew's head in right, but Gagne whiffed Gomes to keep the game close as the Sox came up for their final at-bat.